Geological risks encompass all kind of natural hazards caused by geological conditions: Volcanic eruptions, earthquakes, tsunamis, mass movements (e.g. landslides), floods and sinkholes are a matter of common knowledge. Any utilisation of the subsurface has to face up with the presence of geological risks, regardless whether naturally initiated or inducible by human impact. It is generally acknowledged that the seismic risk is the only major hazard as related to the subsurface of the Alpine Foreland Basins. Earthquakes usually evolve in the Earth's crust at depths of several kilometres and are related to rock stress and ruptures caused by tectonic processes such as apparent in recent orogenies like the Alps and Apennines. Even though epicentres of stronger earthquakes are located at depths far beyond the reach of human impact, any major utilization of subsurface potentials must consider the possible seismic risk. In the northern Molasse Basin the seismic risk is comparably low, major earthquakes are few and far between, but featuring considerably more seismic events in the western part of the basin than in the Bavarian or Austrian parts. In general, most major seismic perceptions are long-distance effects of earthquakes induced by tectonic structures beyond the Molasse Basin, such as the seismogenetic structures due to Alpine thrusting or the rifting of the Upper Rhine Graben. Destructions by earthquakes in historical times have been reported only occasionally for the south-western part of the basin, lately near Annecy (Savoy) in July 1996 reaching a 5.3 magnitude (Mw). Wedged between the Alpine range and the Jura Mountains the ongoing Alpine thrusting has an enhanced effect. On the contrary, the Po Basin compressed between two concurrent orogenic thrusts: the south-verging Alpine nappes in the north and the north-verging Apenninic nappes in the basin's south is characterized by a significant seismic risk, recently testified by the magnitude (Mw) 5.8 May 2012 earthquake at Mirandola. 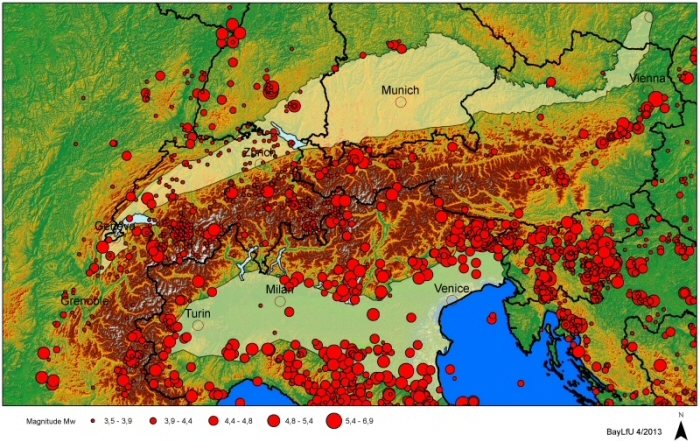 Among the destructive seismic events in historical times Verona (1177, Mw 6,5) and Brescia (1222, Mw 6,0) in the north-central part of the Po Plain are very likely related to the deep faults connected with Giudicarie and Schio Systems, principal displacements of the Alpine orogen. Other major events are related to the northward thrusting of the Apenninic sheets buried deeply in the Po Basin, e.g. Ferrara (1570, Mw 5,9) and Soncino (Cremona, 1802, Mw 5,6). As evident from the 2012 Po Plain earthquake sand liquefaction caused by the seismic shock waves may strongly amplify the seismic impact. An assessment of seismic risks, thus, must also consider the distribution of unconsolidated sediments at shallow level alterable by seismic impact. Similar processes due to uncontrolled groundwater abstraction and drawdown may lead to an accelerated compaction of fine-grained sediments triggering subsidence phenomena, cavities formation, and consequent sinkhole risk. Sustainability of geopotential development requires a sound assessment of the geological structures which may generate a seismic hazard or enhance its impact  at least in those areas where a seismic risk is proved or assumed. GeoMol will provide a characterisation of seismogenetic structures in the most imperilled areas and an evaluation of unconsolidated top layers which might enhance the earthquakes' effect or might be vulnerable to overuse of ground water. The models prepared within the scope of GeoMol feature 3-dimensional information on the structural setup of the subsurface thus providing an important foundation of decision-making for the secure deployment of green energy generation and storage ensuring sustainability and consensual societal perception.